Marketed in stores at this time of year as a ‘living Christmas tree’, the Norfolk Island Pine is very unique plant for your home or office. This tree is native to Norfolk Island, a small island in the Pacific Ocean between Australia, New Zealand and New Caledonia. It is sometimes called a star pine or triangle tree, although it is not a true pine. In its native habitat, it can grow to heights of 50-60 meters. It has been widely distributed as an ornamental landscape tree in humid-subtropical climate regions of Australia, Brazil, Chile, New Zealand, Peru, Portugal, South Africa, Spain, and coastal areas of the United States, such as southern California and the east and west coasts of Florida, as well as the northwestern-most coast of Mexico. Young trees are sold year round in Canada as indoor house plants. They offer a long-lasting alternative to a fresh cut Christmas tree. Use only ornaments as decorations and cool LED lights. Incandescent lights will quickly burn the foliage. Very small trees look great in indoor holiday fresh tropical arrangements. The Norfolk Island pine is somewhat of a finicky houseplant, but with a little care and attention, it will remain beautiful for years. This tree requires full sun; in lower light areas it will thin out quickly. They have notoriously weak root systems. Regular fertilizing will help strengthen the roots and you may need to stake the tree for added support. Norfolk Island pines are vulnerable to pests including aphids, mealy bugs, scale, and white fly. Check regularly to catch infestations early and treat accordingly. Indoors in the winter, the dryness will cause the ‘needles’ to turn brown and fall off. Try to keep the humidity in the room as high as possible. 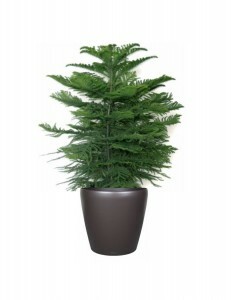 Norfolk Island pine trees need moisture and require consistent watering. Water them thoroughly each week during the growing season to keep the soil slightly moist. Don’t allow them to dry out, particularly during the summer. During the inactive winter months, let the soil dry out completely and then water lightly.